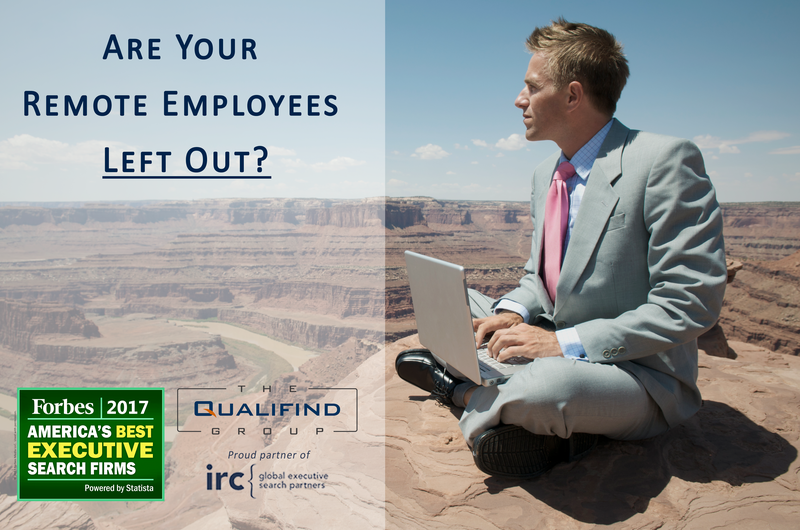 Are Your Remote Employees...Left Out? 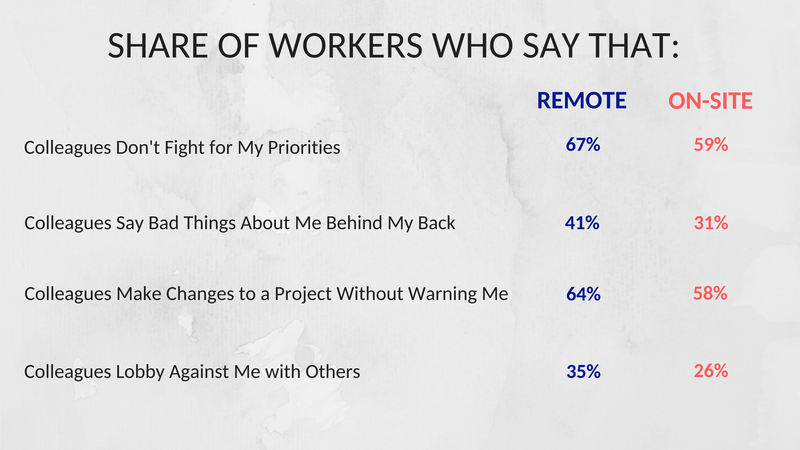 Did you know that remote employees are often more impacted by office politics than on-site employees? Do you ever think that your remote employees are immune to office politics? According to a survey of 1,153 global employees, of which 52% worked from home, the virtual workers felt the impact of office politics more acutely than those working onsite. The 2017 survey conducted by VITALSMARTS noted such negative impacts as increased levels of stress and lower morale and productivity. However, survey respondents went on to say that more effective managers could counter these effects by checking in more frequently, using video or voice communications versus over-reliance on email, taking care to communicate more clearly, and prioritizing personal connections. According to a separate survey (2017 State of Telecommuting in the U.S. Employee Workforce) conducted by Global Workplace Analytics, the number of people working remotely within the U.S. has increased by 115 percent over the past 10 years. The actual numbers behind this show that 3.9 million U.S. employees (2.9 percent of the total U.S. workforce) work from home at least 50% of the time, which is up from 1.8 million in 2005. The average age of telecommuters is 46, has at least a bachelor's degree and earns a higher median salary than an on-site worker. The population of telecommuters is roughly split between men and women. Working remotely is more common among employees over 35 years of age and most common among baby boomers. Does your organization have an "out of sight, out of mind" mindset when it comes to its remote team members? We understand how easy that mindset can creep into an organization. Many of The QualiFind Group's researchers and consultants work remotely from those working at our main office in Chula Vista, California, so we understand the importance of regular and clear communication. Many of our team members collaborate on various client recruiting projects that require daily or weekly communication. Rather than use our company conference calling feature, we more often opt to use Skype or Facetime, making the communication more direct and personal. While video conferencing like Skype can have bandwidth challenges, the ability to read body language and have a more personal dialogue often far outweighs a phone or conference call. In this age of Virtual Reality and Artificial Intelligence, it's important to remember… we are all human after all, and no one wants to be left out of the game!